OFFICE LOCATED WEST OF ROGERS AND PATTERSON. FROM SO WALNUT, TURN WEST ON GRIMES, WHICH BECOMES PATTERSON, FOLLOW TO 515 W PATTERSON. The Bloomington Social Security office is located in Bloomington 47403. The following page includes information for this location like the office phone number, hours of operation and driving directions. If you have any interests or comments about your retirement benefits or are interested in making an appointment, call the following Bloomington Social Security office. The Bloomington Social Security office is located at Bloomington 47403. The Indiana SSA has separate federally run plans like retirement, SSI, Medicare and disability benefits. The following page contains helpful contact information for this location such as the Social Security office phone number, hours of operation, and driving directions. 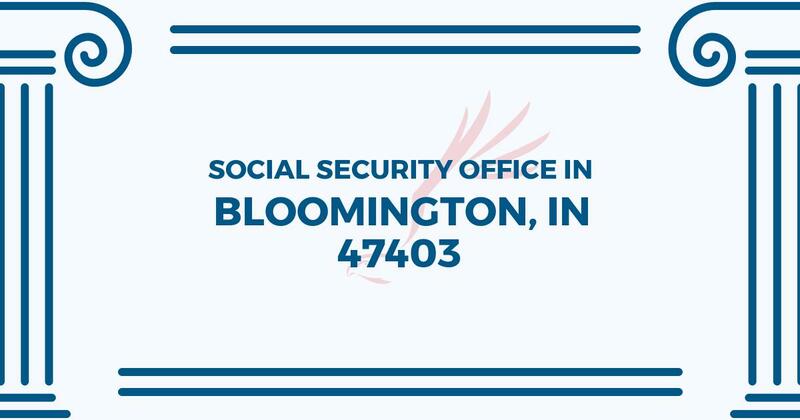 If you have any concerns or requests about your retirement Social Security benefits or interested in setting up an appointment, call the following Bloomington Social Security office. I have schizo affective disorder and depression and receive SSDI, so the disability and medical requirements are difficult for me to understand; I’ve had to go the the office in Bloomington, IN a few times and have an employee help me with paperwork. Each time I’ve been there, I had a positive experience and the information was explained to me so that I could understand the paperwork. Everyone I’ve talked to has been nice and very helpful, and I appreciate that.